When it comes to holidays, we’re still in that season of life where our parents take the reigns, but we love bringing something fun to the table, literally! ;) I love dying Easter Eggs with Charlie and Claire. Being realistic, usually we don’t go wild. It’s pretty low key, but it’s really just all about creating the memories and traditions, you know?! I must admit, this year, I’ve gone a little more wild than the norm because my mind just won’t shut down at bed time with ideas! ;) I feel like some of my favorite ideas have hit me at night. I keep a note pad and pen in my nightstand for that specific reason alone! Who else is OBSESSING over the whole iridescent trend? I’ll be honest! I did not love it at first, but it’s slowly but surely been growing on me. Now whenever I see it, I get excited. Not like a “pink” level of excitement (lol), but it definitely brightens by day! As I’ve had these iridescent stars in my craft closet for the longest time, I’ve been thinking about the perfect excuse to bust them out. I’ve also had these edible gold star sprinkles, so I made a whole hay day out of it and got busy crafting! ;) I know the iridescent star confetti isn’t edible, so here’s a hack for that. Score these plain white DIY eggs and you’ll be set up for success. These are SO easy that you can make these half awake on a Monday morning. The kids could help, and if your child is 5+ you could probably get away with sneaking away to grab a snack out of the fridge or heck even use the bathroom without being barged in on while you make these. ;) If you haven’t noticed, that’s my season of life these days. LOL! Sorry about the TMI! PS. If you want to create these eggs for a table setting and make sure they are NOT edible, I just found these plain white DIY eggs that you’re able to paint and save year after year for a display. So fun! 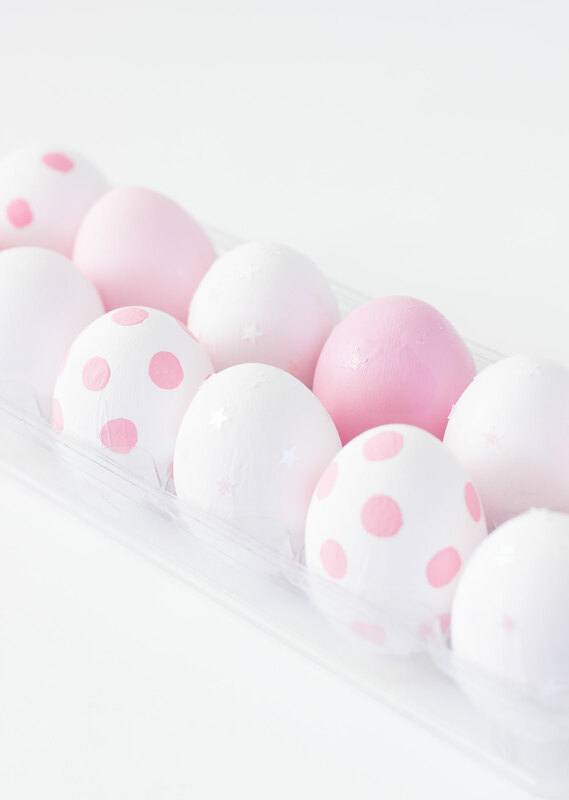 Paint your eggs with one of your shade of pink paint and let dry. Repeat using a different shade of pink paint for each egg. Paint half of your eggs white. Sprinkle on your gold star confetti while the paint is still wet. Let dry! Paint the remaining eggs pink. Let dry. Use your super glue to make small dots onto your egg and sprinkle on your iridescent stars. Let dry!